If this doesn't excite you, then check your pulse...because you're not well!"" Chrysler's then company president, Lee Iacocca, introduced the first Viper to roll off the Dodge production line back in February 1990... and it's a statement that still holds good today! It is one of the most exciting, soul-stirring sports cars ever to burn rubber. The 200 mph, 8-litre V10 has become a legend. 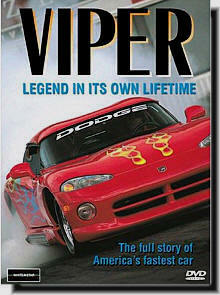 This is the whole story - from that first production car through to the Viper's 1998 class-winning success at Le Mans. We hear from the key players in the creation of the Viper and from those currently involved in the designing and building of Vipers present and future. The legend continues to grow with new, sought-after models. This program travels to the 2008 North American International Show in Detroit for an up-close look at the limited edition SRT10 ARC version. There's also a chance to see this awesome car in action on the factory test track. The legend continues to grow with new, sought-after models. This program travels to the 2008 North American International Show in Detroit for an up-close look at the limited edition SRT10 ARC version. 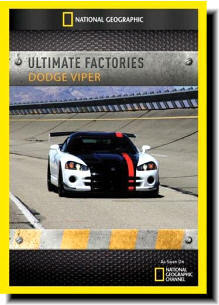 There's also a chance to see this awesome car in action on the factory test track.